Coming up this week – Highway Cleanup on Saturday, the 16th. We will meet for breakfast @ 6:00 at Crossroads. If you can’t (or don’t want to) get up that Early, please join us at 7:00 for the actual clean-up. On Monday, the 18th we will be attending the closing ceremonies for Camp Neidig down on the banks of the Manatawny. If you haven’t ordered your chicken dinner , you can still go down to enjoy these young people with all their enthusiasm. We would be remiss if we didn’t mention our members who received recognition for EREY donations last week. John Alshefski, Tim Bitting, Sean Fitzgerald, Tom Kisling, Jack Krishock, Allen Moyer and Lin Seyler are all looking for a place to hang their new hardware. Send us a picture of the place of prominence you find for your award. Surely, we will need more carved Rotary wheels to honor our other members as well in the future. Last evening was a busy one for Muhlenberg Rotarians. 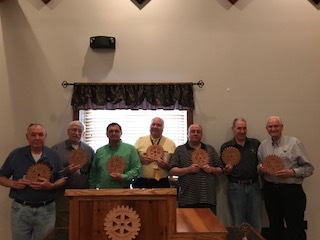 We began by electing Directors for the 2018-2019 year for the Rotary Club of Muhlenberg Charitable Foundation. By unanimous vote we chose Steve Adams, Sean Fitzgerald, Tom Kisling, Jack Krishock, Mike Lepera, Terri Pfennig and Lin Seyler. At a short board meeting held immediately after the regular meeting, the Board of Directors approved the budget submitted for the coming three Rotary years. Spending to the limit of funding in this budget can now be done by the officers without further authorization. Any expenditures outside of these items, however, will require Board approval. We had quite a discussion of changes to the fruit sale. The supplier we used last year has merged with a new outfit, Peejay’s. Allen Moyer has taken the time to investigate what this means to us, and it has some new, nice features. The product line is slightly different with the merger, but gives us a chance at new offerings, tangelos (really an old offering), and clementines. We will also be able to do online ordering and payment, a great improvement. The new vendor will provide some promotional materials and will subsidize (25%) up to $100 for our promotional materials. In line with this, Allen has developed a handout for our events, like Riverfest, Wine&Dine and the Flea Market. No prices yet, but good information to promote sales. Some discussion about the product line, like dropping juice oranges, was tossed around. Also, our ability to not order too much fruit “on Spec” was discussed and we hope to minimize any fruit left after the day of sale. We need details and definition on some items: How do we sell pecans? How do we include the other clubs? How will this work for the day of sale, with respect to our loading dock process? Allen is on top of this, and will get answers as we deal with the new people.